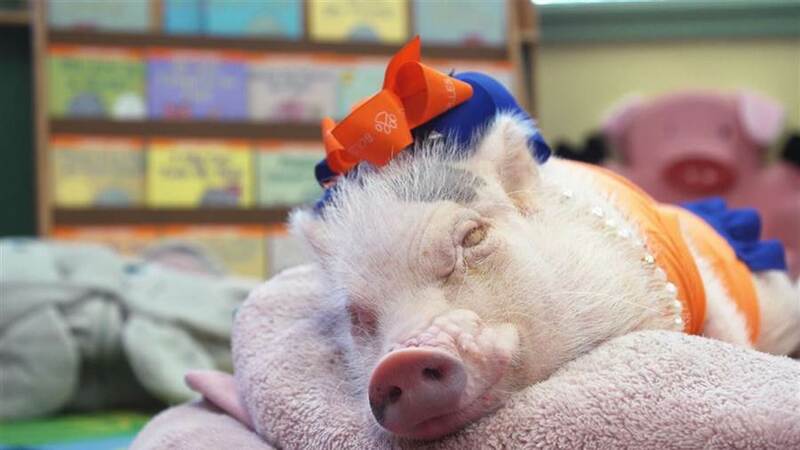 There’s more to these mini pigs than their extensive wardrobe and their popular Instagram account.Priscilla and Poppleton — or Prissy and Pop for short — also attend first grade at the Bolles School in Jacksonville, Florida. The pigs have been going to school with their owner, teacher Melissa Nicholson, for nearly four years. Nicholson has been teaching for more than twenty years, and says she first became a “pig person,” during her college days, when, as a student at the University of Alabama, she visited a friend’s pig farm and got to hold day-old baby piglets. From there, Nicholson’s love of pigs grew until the summer of 2013 when she came across mini pigs for sale on Facebook. Half joking, Nicholson texted her then principal with a photo of Priscilla and the words, “Class pet?” When the principal replied, “Sure!” Nicholson knew she’d found a way to combine her callings. Prissy and Pop have also starred in two children’s books — Prissy & Pop: Big Day Out and Prissy and Pop Deck the Halls. And, Nicholson plans to offer math and reading summer camps starring the pig duo to children this summer. The pigs also have more than 650,000 followers on Instagram, where Nicholson posts photos of their antics and fashion choices.